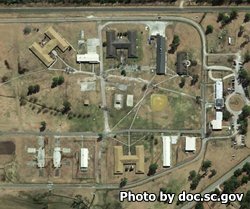 MacDougall Correctional Institution is a level 2 medium security prison located in Ridgeville South Carolina. The current capacity of this institution is 671 adult male offenders. Inmates are housed in double bunked cells or cubicles. During the offenders incarceration they can take vocational courses in auto body repair, horticulture and masonry. MacDougall Correctional Institution participates in the correctional industries program employing inmates under a private contact performing the disassembly of hydraulic pumps. Inmates at MacDougall Correctional Institution are provided on site medical care, and can participate in substance abuse treatment, learn to read, obtain a GED, and receive re-entry programing during their incarceration. Offenders may be selected to work outside of the prison on supervised crews that clear roadways of litter and debris. Visitation at MacDougall Correctional Institution is on a rotating schedule according to the first letter of the inmate's last name. You will need to contact the facility to see which day and time they are allowed visits. Visiting can occur on Fridays from 6:30pm-8:30pm, Saturdays and Sundays from 8am-12pm and 1pm-5pm but the day and time your inmate will be allowed visits is on a rotating schedule according to their last name.